How Do I Handle a Bad Eating Habit? For much of my life, I have had eating habits which were not healthy. I love pastries. Back before I ‘got religion’ I would think nothing of eating a scone for dessert. This was following a meal of 1500 to 2000 calories. It is no surprise that I ballooned up at my worst to the 220 pound area with a plus 40 inch waist. You can read about How I lost 50 pounds in 52 weeks. 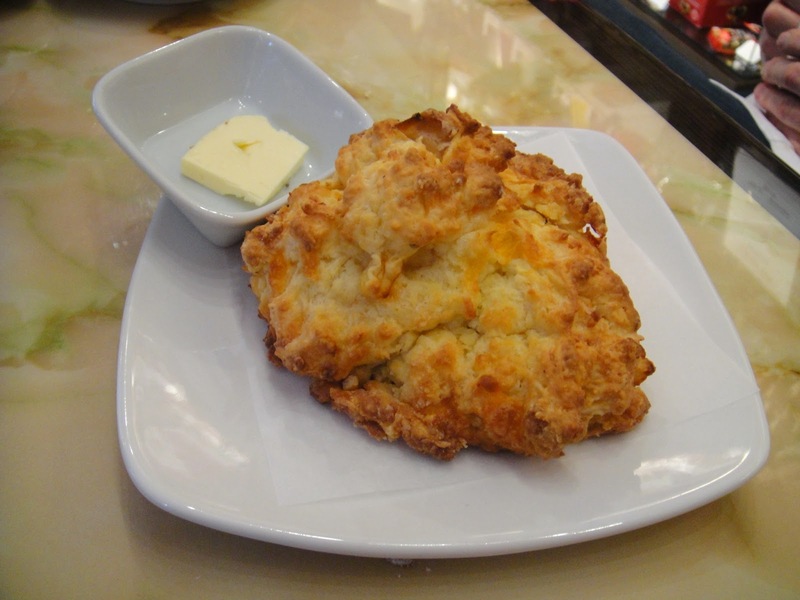 The scone weighs about 8 ounces and, as a ball, measures 4 to 5 inches in diameter. These days I clock-in around 150 pounds and sport a waistline in the low 30 inch range. But I still love pastries in general and scones in particular. The difference is that I don’t eat one for dessert after a big meal. However, I still eat them and maintain my girlish figure. What’s the trick? The photograph is one of my scones. It comes from a little coffee house in Chicago called The 3rd Coast. They make them there, so it is impossible to get a good calorie count. The scone weighs more than 8 ounces and is loaded with scrumptious dark chocolate chips. I am guessing that a single scone must total close to 500 calories. The Lose it! app puts the Jamba Juice Orange Chocolate scone at 380 calories. So, how can I enjoy eating a sinful delight like this and still maintain my weight? Well, I have altered my eating habit as follows. I take the scones home and cut each one into at least quarters or fifths. I take one section and put it in the toaster oven while wrapping up the remainder for another day. It toasts up lovely and I am able to enjoy several luscious bites every day without packing on a lot of empty calories or fats or feeling bloated and overfed afterward. I figure I am getting around 100 to 125 calories instead of the 500 I used to consume. You might consider something like this yourself with a particularly tasty, but empty-calorie-dense, treat that you enjoy. That way, you don’t have to white knuckle it by abstaining completely. You simply have to learn to savor it and be satisfied with some but not all of it. So now you know a way to halve your cake and eat it too.